Save money and help save the planet by purchasing products in bulk quantities to reduce packaging. You’ll send less trash to the landfill and have money left over for other things! Purchasing foods in bulk quantities saves you money because you get to buy what you want without paying for expensive advertising and packaging that drives up costs. 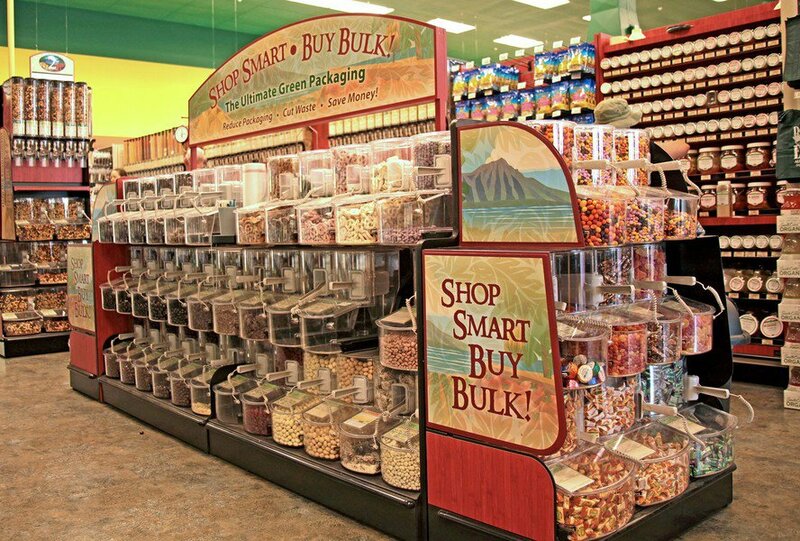 We have the most extensive selection of bulk foods on the island, with many organic and non-organic options for natural nuts, grains, beans, flours, pasta, cereals, sweets, herbs, specialty items, and a wide variety of trail mixes. Bulk foods are sold by the pound, herbs and spices by the ounce, so you can get just the amount you need. We encourage this most economical way of purchasing food as it eliminates waste and the cost of unnecessary packaging. We’d be happy to let you sample items before you buy, just ask a team member to assist you.